Over the past 15 years, Junot Diaz has produced two major works: Drown, a short-story collection highly praised for its energetic prose and distinctive voice, and the novel The Brief Wondrous Life of Oscar Wao, which won the Pulitzer Prize. Both works focus on the life of Dominicans living in New Jersey and include Yunior, a Dominican-born New Jerseyite, as narrator. 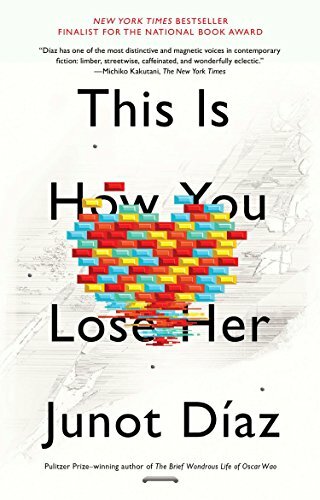 In This Is How You Lose Her, his new collection of nine interrelated stories, Mr. Diaz revisits the lives of immigrants with the linguistic gusto that has become his signature. Mr. Diaz delivers vibrant prose liberally seasoned with Spanish, slang, and profanity. Since Yunior grew up on the streets of Jersey but is heading for a professorship in English, as narrator he can credibly mix Latinate and street vocabulary. He might describe his girl’s “pulchritude,” and, in the same breath, deliver an expletive-filled blow-by-blow of what he does with or to her. Mr. Diaz’s slice of Dominican life in New Jersey is filled with chiles y chicharrones. This flavoring serves up the meat of the book, making for tasty reading indeed. Ironically, the vivid language and lively characterization service generally weak plots peopled by characters who cannot move forward in their lives. In “Invierno,” a mother and two boys come to New Jersey to join their father. The characters hover between the Dominican Republic and their new home in New Jersey; they are in limbo, waiting out the winter in their apartment. In spirit they are Dominicans, but in time and place New Jerseyites. In “Otravida, Otravez,” the uncertainty of immigrant life causes people to dream of the past and future while stuck in the present. Perhaps the predominant reason for the lack of positive change in the lives of the characters is the unrestrained sexual desire that destroys relationships. The men are always on the make; testosterone fuels these lives. In “Alma,” a man who has been found out feels sadness in sexual terms: “You take your time turning off the car. You are overwhelmed by a pelagic sadness. Sadness at being caught, at the incontrovertible knowledge that she will never forgive you. You stare at her incredible legs and between them, to that even more incredible popola you’ve loved so inconstantly these past eight months. Only when she starts walking over in anger do you finally step out. You dance across the lawn, powered by the last fumes of your outrageous sinverguencería. Hey, muñeca, you say, prevaricating to the end.” These men, including Yunior, who reappears in several stories over the course of time, do not evolve. A man cheats, a woman discovers it, the relationship dies. In these stories, this is the extent of the ways in which he loses her. It becomes as predictable as the tides. Yet these predictable plots and general hopelessness and malaise are brightened by Mr. Diaz’s spirited language. Junot Diaz is a writer to be admired and enjoyed. Do read his stories. You can digest one in a single seating. If you are swept along by his linguistic fireworks and strong evocation of person, place, and culture, This Is How You Lose Her will not disappoint. But those searching for a compelling plotline played out by psychologically complex characters best look elsewhere.